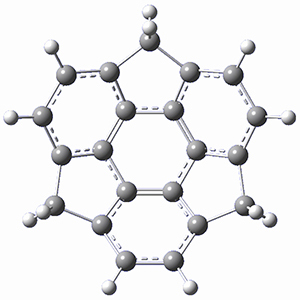 They obtained an interesting structure, characterized by x-ray crystallography: a mixture of the dianion and trianion of 1 (well these are really conjugate di- and tribases of 1, but we’ll call them di- and trianions for simplicity’s sake). A fragment of the x-ray structure is shown in Figure 1, showing that there is one potassium cation on the concave face and six potassium ions on the convex face. Figure 1. X-ray structure of 1 surrounded by six K+ ions on the convex face and one K+ on the concave face. To help understand this structure, they performed RIJCOSX-PBE0/cc-pVTZ computations on the mono-, di-, and trianion of 1. The structure of 1 (which I optimized at ωB97X-D/6-311G(d)) and the trianion are displayed in Figure 2. 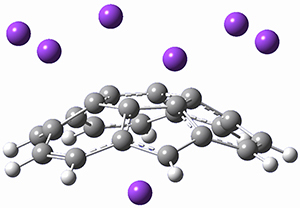 The molecular electrostatic potential of the trianion shows highly negative regions in the 5-member ring regions, symmetrically distributed and prime for coordination with 6 cations. Figure 2. 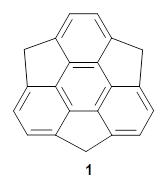 Optimized structure of 1 and its trianion. (1) Spisak, S. N.; Wei, Z.; O’Neil, N. J.; Rogachev, A. Y.; Amaya, T.; Hirao, T.; Petrukhina, M. A. "Convex and Concave Encapsulation of Multiple Potassium Ions by Sumanenyl Anions," J. Am. Chem. Soc. 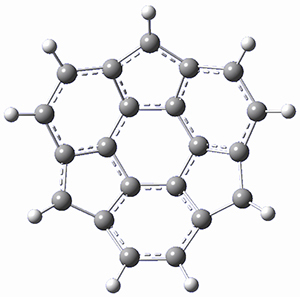 2015, 137, 9768-9771, DOI: 10.1021/jacs.5b06662.